As the time comes closer for the IPL 2018, we see that there’s a serious sword-swinging going on between Airtel Digital TV and Star India. For a while now, Airtel Digital TV subscribers are getting notified that their Star channels streaming will be disrupted and turned off if they do not transition to other DTH providers. The actual notification which has been flashing as a banner and for which Star India has also dubbed a video intimidates the users about putting a full stop to the Star channels on Airtel Digital TV and urges them to change their DTH provider. Airtel Digital TV had allegedly been charging as high as Rs 1000 for Star Channels, which frankly speaking is an obnoxious amount of money for such a thing. After this incident of overpricing, industry experts started claiming that the price hike was because Star India had spent a fortune, specifically speaking Rs 16,347.50 crores, in buying the broadcasting rights of IPL for the next five years. 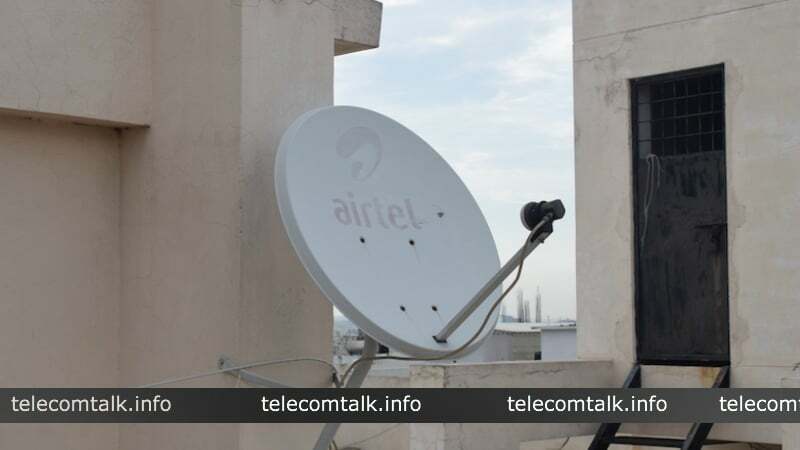 However, Star India refuted those claims at once again with bold statements putting the blame on Airtel Digital TV, saying that the price hike was not done on their part but instead by Airtel Digital TV. Airtel issued an official statement on the company’s behalf denying all allegation made by Star India. Airtel also used strong words and bold mannerisms to put forth their word out in the public. This gave further fuel to the controversy which was already steaming since some days now. 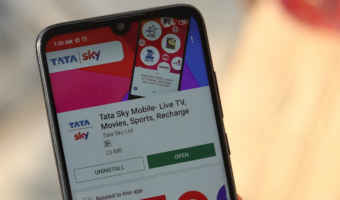 Airtel said that it was ‘public knowledge’ while speaking about Star India’s buyout of the IPL broadcasting rights and further added that Star India is extracting money from customers by this price hike. They said that Star India was trying to charge a higher amount of money thus it was essential for Airtel to increase the prices for their customers based on the RIO. Airtel also said that this was done only because Star TV presented them with an unreasonable hike in the prices which rendered them without any option but to hike the price themselves. Thus, they refuted the claim that the prices had been increased by them ‘unliterally’. Airtel, however, seems to be taking the soft spot for the sake of public interest despite their harsh words against the doings of Star TV. Following the controversy, Airtel made it clear that they were implementing some measures to ensure that the public did not suffer because of this raging way between the DTH operators and entertainment company. They said that the difference cost by the price hike would be bore by Airtel Digital TV and the public won’t have to give more money to watch channels which included SD (Standard Definition) channels from STAR network, for the same they’ll be required to go to channel no. 102 and acquire information to activate these channels. They also put out a statement that there will be no hurdle for their viewers in watching sports channels and that events like IPL will be run without any hindrance for the public on Star Sports 1 and Star Sports 2 for the eligible customers. 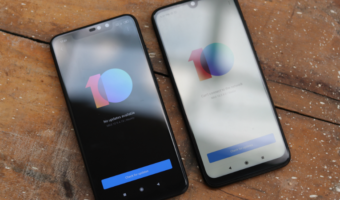 Next, Airtel said that they would charge the customers with same prices as what Star TV will charge them for the channels and not a rupee more, additionally the HD channels from STAR will be available as an option to which users can subscribe if they deem the prices as suitable. These above-mentioned steps if executed well by Airtel are expected to bring some cool into the already flaming battle between the two. However, there’s no denying the fact that STAR TV has alleged Airtel of unilaterally increasing the prices and then Airtel has replied back by calling STAR TV’s tactics as “arm-twisting” has put even Industry experts in confusion. 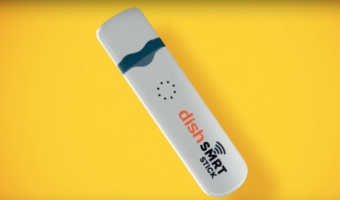 Also, rumours have been surfacing that Dish TV might also be going through some push and pull with STAR TV. Given that the IPL stars on April 7, it really seems convenient on STAR TV’s part to hike the prices before the start of the same. Meanwhile, on the one side STAR TV and Airtel Digital TV go on with their conflict, another similar case seems to be brewing between ZEE and DEN Networks. 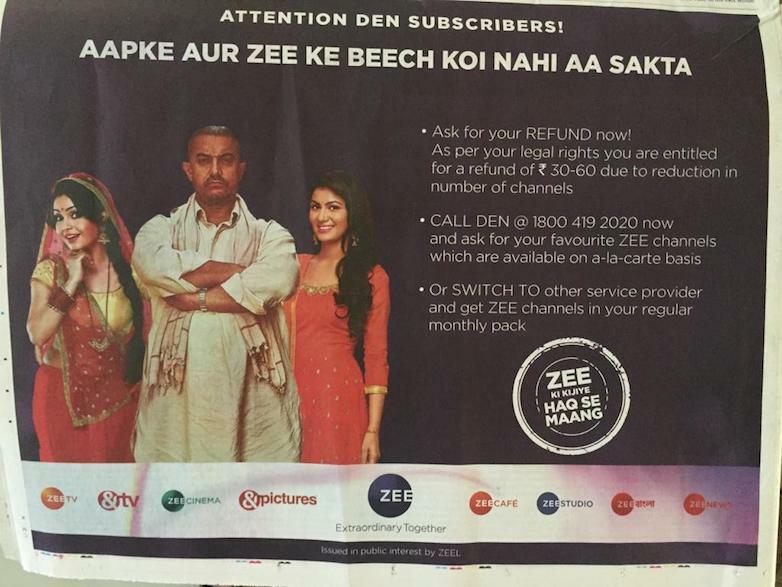 ZEE in an audacious TV advertisement has brutally put out a statement saying that DEN subscribers should ask for a refund of Rs 30-60 from DEN as there has been a reduction of channels, specially ZEE channels on the DEN network. This seems to be a similar case of strong-arming by yet another entertainment company. The advertisement outlines that people can subscribe to ZEE channels on the a-la-carte basis by paying more to DEN or lastly, they can change their DTH provider. This bold newspaper advertisement is bound to initiate another struggle between DEN networks and ZEE, on the same lines as the STAR TV and Airtel conflict. These new controversies put the Industry experts under pressure and has got them thinking about what’s going behind the scenes to cause controversies on such a big level. End of the cable tv era, subscribe to Netflix get over with this crappy saas bahu dramas. As if everyone can afford to pay 500-1000rs every month, especially for a platform which doesn’t have much Indian content. GG, Netflix have quality content if you like english shows. Affordability is a different question, some people may find 199rs for 28GB to be expensive too, so Internet TV is the future. AU, true. I watch most of their original shows. But I still don’t think their high rates are warranted in India. They should halve the rates and do movies and shows in Kannada, Tamil, Telugu, etc. Also, the high quality is starting to come down since they are doing a lot of shows and movies now. 40 year old aunties watch these star olus drama. I can count on you too. +1000% Agree. Pay RS.700 for Netflix subscription and another Rs.800-1000 for unlimited super fast broadband. IPL is stupid and watching it must be discouraged. I haven’t seen even one IPL match for more than 5 years now.